Musings of a former Canadian government scientist from behind the muzzle. As I try to move on to a more positive mind set, and leave the bitterness of my government science days behind me, I’m less inclined to keep this blog going on a regular basis. But then I see a gem like this. Go and give it a read. If you’re not a government scientist (or was recently one, or work or live with one), the results are shocking. I, on the other hand, am just glad the news is getting out. AND, if you haven’t yet started following SpeakUpForScience’s blog/mailing list, go sign up now. And if you’re on twitter: @speakupforsci. Some good stuff coming from there. Should we give Harper what he wants? A shift in the focus at NRC to strictly industry-based investigation. Misrepresentation of facts as to how scientific research is conducted by Government Ministers, requiring correction for the public record. Release of a “National Household Survey” with data so questionable and reporting so poor that Stats Canada won’t even release some of the results they did get (and yet somehow, we have a handle on how many Jedis reside in Canada). Laying off even more scientists and researchers at Agriculture Canada. Putting out notice that science in the arctic is about to change, “to make sure science is relevant” as the new chair of the Arctic Council, Leona Aglukkaq, Conservative Minister of Health for the Canadian Government. And all this just in the past couple of weeks. You can add to this heap the myriad of cuts to science in this country, outlined so well here, science jobs cut across the board in government departments, and the ongoing pile of rules and regulations which limit our effectiveness as federal scientists that I’ve outlined on this blog. Someone looking at all this might conclude that the Harper Government doesn’t really appreciate science, particularly the science that his own public service generates. So I’ll pose the question: what if we gave Harper what he seems to want? That is, provide a demonstration of what the public service might look like without science. Government scientists are a unionized bunch. We have a union that is supposed to support us when there is an indication that our employers are negatively impacting our ability to work efficiently and effectively. If there was a health and safety concern at my office, restricting me from doing work in my lab, and my employer (the government) refused to do anything about it, I could turn to the union who would support my refusal to work in unsafe conditions. It may not be risking my life, but I don’t think it’s much of a stretch to say that my employer is limiting my ability to effectively do my job. I require permission to seek the funding that supports my research, even before I apply for it, therefore limiting my ability to do said research. I require a manager to sign off on the papers I’ve written based on the research I’ve conducted on behalf of the crown, which has the potential to limit my ability to communicate the research I’ve conducted. I require levels upon levels of approval to hire even summer students to help me conduct my research (paid for by the funds I’ve secured), and frequently can only hire someone months after I needed them to begin initially. I work in an environment where I am actively discouraged from communicating my work to the public without expressed permission. And the more layoffs come, the more the remaining scientists are getting leaned on to pick up the slack and do the jobs of all the people who are gone in addition to their own responsibilities. I complain to my superiors about all of this, and all I hear is “this isn’t my fault, it comes from… [insert scapegoat here, including Minister’s office, Treasury Board, etc…]”. So, here’s my proposal- if we as government scientists can’t effectively do our job, then perhaps job action is required. The Harper government doesn’t want science? Fine. Let’s see how well they do without us, and how they deal with the media circus around their own government scientists refusing to work under the current dysfunctional climate. I am proposing that government scientists (myself included) should go on strike. PIPSC is our union. The RE group, to which we belong, has their annual general meeting June 1st, 2013. I think this should be a topic of discussion at that meeting. I’d like the Union to seek the input from its members on this, or provide some thoughts as to why this is untenable. If not a strike, then some coordinated job action- work to rule. Refuse to participate in all those off-hand consultations that we do for the department just because we’re nice people. Walk outs. Coordinated protests. Let the media feast on government scientists in lab coats picketing right outside their government offices. We can’t talk, so our union reps can do the talking. I’d welcome any feedback here on the topic. I’ll say right now that this would likely be a tough sell- research scientists are deeply committed bunch to the work they do. But I am having a hard time imagining how we can expect things to get anything but worse given the direction things are going, and I don’t see how we as government scientists can sit by and watch this happen anymore. This is a majority government who we’re stuck with for at least two more years. Given their track record, I’m legitimately worried about how much more damage this bull will do in the china shop before someone finally shows them the door. My first ever post on this site was a response to Andrew Weaver (climate scientist, and newly minted MLA in the British Columbia Legislature) that government scientists should rise up. In it, I outlined why this was a challenging thing to ask. As a single person, there is much to lose. But if we have the support of our union, there is strength in numbers. 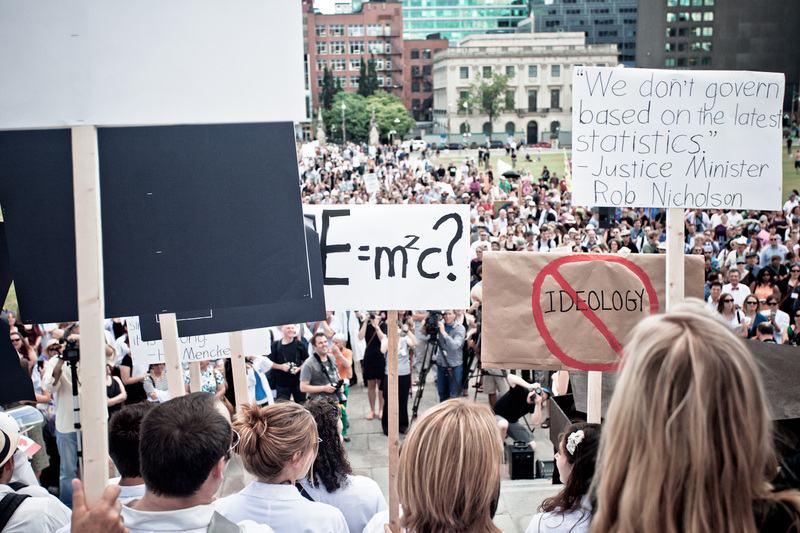 The academic scientific community in Canada and the world has taken a stand and voiced their objections. Perhaps it’s time government scientists do the same. Facts, or lies. There is no “alternative”. How muzzled are government scientists now? Open your mouth and say… Science.